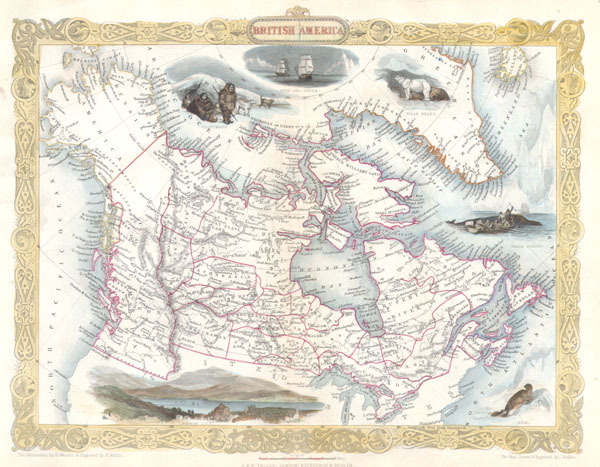 This is a rare and curious first state first edition of Tallis's 1849 map of British America or what is today Canada. Extends from Russian America ( Alaska ) east as far as Greenland and Iceland. Inexplicably, this map recognizes the British claim to Oregon as far south as the Columbia River. This dispute was supposedly resolved three years previously in 1846 by the 'Oregon Treaty' which officially set the U.S – British America border at the 49th parallel. Features numerous decorative vignettes typical of Rapkin / Tallis work including a seal, whale fishing, the exploring ships Fury and Recla, a polar bear, some Esquimaux (Eskimos) and a view of Boston. Later versions of this map would replace the Boston view and update the political geography of the Oregon region (called New Georgia here). This particular version never made it into the Tallis's important 1850 atlas, instead it was issued exclusively for the 1849 edition of Hinton's History and Topography of the United States. The illustrations are by H. Warren and engraved by R. Wallis; the map is drawn and engraved by J. Rapkin. Published by the John Tallis & Company, London & New York in 1850-1852. Hinton’s History and Topography of the United States., (1849 edition). Rumsey 0466.067. Phillips 804-6. Hinton, John Howard, The History and Topography of The United States of North America From The Earliest Period To The Present Time, 1849.